Microsoft Office is a suite of programs that I’d imagine most people have encountered, whilst it’s a good suite of programs and all University of Sussex staff have access to a full licence (details on the ITS website ), it is not the only option. G Suite is a collection of programs created by Google, which is free to use. If you already have a Gmail account then you will have access to G Suite, otherwise you can sign up using any existing email address. There are three main programs; Google Docs, Google Slides and Google Sheets that are alternatives to Microsoft Word, Powerpoint and Excel respectively. There are a number of secondary apps such as Google Calendar, Gmail, Google Hangouts and Google Forms but for this post we’ll be focusing only on two of the most used programs, Google Docs and Google Slides. Google Docs works like a more streamlined version of Word. Both have the same basic functionality for writing a text document, although Word has more advanced user tools and options such as watermarking, multi-column layout and advanced formatting. Google Docs provides an easier and simpler user experience as there are fewer options to pick from and a less cluttered interface. Google Slides enables you to create presentations that are informative and visually interesting due to its up to date styles and templates which look both modern and fresh. The navigational structure is very similar to Powerpoint but with a more minimalist approach. It also includes features such as a Q&A for presenters to answer questions from the audience and the ability to easily search for Youtube videos and then directly embed them in your presentations. G Suite and OneDrive are cloud-based so can be accessed from any computer, tablet or mobile device. Rather than relying on a USB stick you can access all your Google Suite documents and presentations from any computer in any classroom as long as it’s connected to the internet. This also means all your documents are securely backed up in the case of a device failing to work or being lost. G Suite documents also automatically save themselves as you work meaning there’s no worries about a program crashing or forgetting to save a document. You’ll be given 10GB of free cloud storage with your Google account in a file storage system called Google Drive, which is where all G Suite documents are stored and accessed. Its useful to note that G Suite documents don’t count against this limit so you can keep creating as many new files as you’d like. Of course there are some downsides and limitations, the most notable being that as G Suite is online, it needs an internet connection to work properly. If you go offline you can still access G suite documents but they won’t auto save and will have limited functionality until you re-connect to the internet. Whichever cloud-based tools and storage you are thinking of using, the ITS website offers some good advice on file storage and the Library has advice on Research Data Management. It is very easy to share your G suite documents with others, all you need is their email address and you can give anyone access to view the live version of your document from their web browser. This means they’ll automatically be able to see any changes you make to your document as you make them in real time rather then having to send files back and forth over email. So if you are sharing resources with students you can update the central document and it will update for all your students. You can also work collaboratively with other users on G suite documents in real time allowing them access to write and edit your document together or allowing them to add comments and suggested changes to a document. This can also enable you to create collaborative lecture or seminar notes with your students. A Google Doc being collaboratively worked on. Any edits take effect immediately, and past versions of documents are automatically saved in case you need to revert back to an older version. This prevents version control issues. There is also a sidebar chat for each document which allows those with access to chat and discuss edits and changes to the document. This can be great for students working in groups on projects to communicate as they collaboratively complete work. 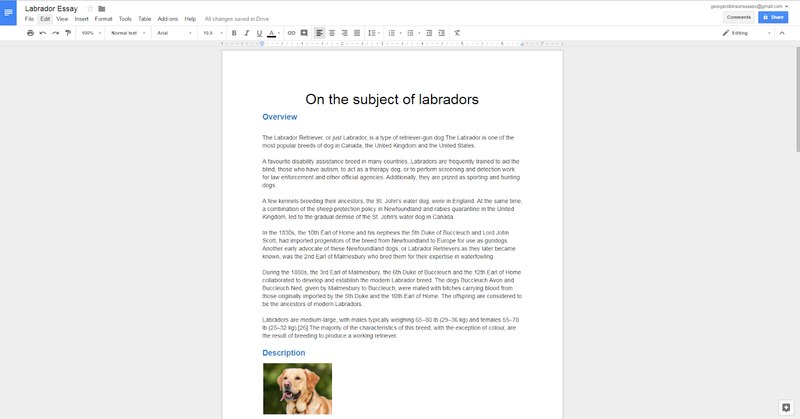 Google Docs also has an Explore feature that reads your document’s content and then offers information and images about related topics from around the web. 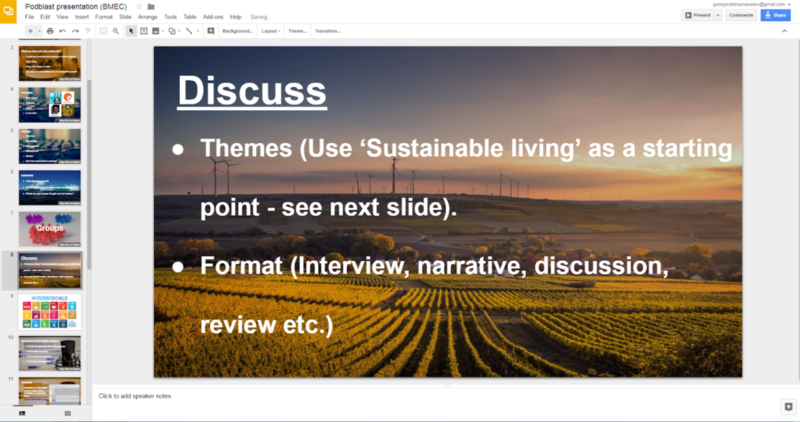 The explore feature can also be used within Google Slides where it helps provide a range of layouts and styles based on the content of your presentation, allowing you to quickly create a visually engaging presentation. Just like Office 365, G Suite and Google Drive will also be able to integrate with our new Canvas VLE, this will enable academics to link or embed content from their Google Drive into their courses and allow students to share, view and contribute to Canvas Collaborations using Google Docs, Sheets and Slides. Share on-the-fly feedback on students’ work using the comments and suggestions features in Google Docs or encourage students to provide peer feedback on each others’ work using the same features. Share a Google Doc of a text, such as an example essay, and ask students to add comments and suggestions. Set up a shared Google Doc for collaborative note taking. Share the web address of your slides with students during class to allow them to make a copy, add their own notes, and go through them at their own pace. To get started with Google Docs simply visit https://www.google.co.uk/docs/about/ and sign up. Google has created a whole website full of helpful guides to getting started using G Suite. The Department of Education here at the University of Sussex successfully used G Suite for Education (a similar version of G Suite but with more features suited towards classroom organisation) with a cohort of PGCE students. To read more about this please see ‘Sussex students to work with Google for Education’. ‹ How do you create stunning visual content for free? Adobe Spark is how.